My collage collection went out today for the International Collage Exhibition and Exchange. I feel that something important has been accomplished and now I can move on to other projects on my list of things to do. Next I need to complete a digital fine art project for a client, which will entail doing several photo shoots and manipulating them in PhotoShop and incorporating some of my abstract images. While I’m working on that, I’ll continue work on the two 30″ square cradled panels that are in progress. My online art business is going to need some tweaking this year, a conclusion that I’ve reached in evaluating what’s worked and what hasn’t in the past year. I’m not sure whether or not I want to reduce the number of websites where my art has a presence. But I’m feeling right now that I’d like to do that. My philosphy in the past has been the more exposure the better. Sometimes I’m found by accident and it turns out to be a good business contact. But it’s feeling a little bit cumbersome to keep all those various websites current. And there are a bunch of them. I will keep Etsy for now, and am moving more toward having some of my work available for sale on my website. The only restriction to that is the need to redirect to my galleries any potential collectors who may be in the selling radius of those galleries. What is your preference for a web presence for your art? Do you have your own website? A blog? Do you Twitter or have a Facebook page? If you have your work on other third party art sites, I’d like to hear your experience about those as well. Examples would be MyArtSpace.com, absolutearts.com, FineArtAmerica.com, etc. As usual you have created another beautiful collage! I love the layers, the colors and the elements you used. It has a very organic feel to me and I like that. Well done! I’m sure you are happy to be able to move on to other projects now. It’s interesting you should bring up about your online presence as I was thinking about asking you which ones worked for you! LOL I was looking at a few of the places where you have your art listed and taking notes and wondering if they were big draws or not. Mostly I was interested in your website as I need to set one up. I’ve had a blog since 2007 but feel I need to have a more professional website to sell from and to draw clients to. Did you set up your website yourself? Would love to hear your input on that…your experience with it all. I’ve sold lots of things from placing my artwork on Zazzle.com so that is encouraging. Had to list lots of items before the sales started coming in. It’s a matter of getting noticed I think as with any other site. I tried Etsy but found that if I didn’t keep listing my artwork every few days I just wasn’t selling anything. Perhaps if I would just turn it out more often I might find a market there. I’m sure I’ve tried other sites but think these are the main ones for now. Itaya, that is a lot of great information! I have sold a print here and there on a couple of sites — Imagekind being one of them. Another place where I sold a large print was boundlessgallery.com. But now I think there’s a fee for that site. But the great thing is that I got a nice commission through Boundless Gallery two years ago. So maybe I should rethink that one. I sometimes think that real concentration on one or two sites would yield the same results, rather than a scatter gun approach. That’s encouraging to hear that you’ve had good luck with zazzle. I haven’t tried it. And yes, you are right about Etsy. You do have to keep renewing things just about every day or you get lost in the haystack. I know, Gina — it’s such a time consuming process that it needs to be something that really counts! Mary Helen, I appreciate your thoughts. Don’t be too concerned about production. It will come with time, no matter how few hours you have to devote to it. It’s the selling part that’s tricky! I like your blog and am so glad to get a window into your world. We are all looking forward to better days in 2010! I am just beginning my whole-heart focus on my art, photography and writing. I have a blog (Creative Potager) which has been well received and profiles my work while supporting creative expression through Sprout Questions. My store front is redbubble which has worked very well for me as I am not fond of the production side of things when it comes to making and shipping prints. Terrill, I appreciate that feedback. I know what you mean about having to ship things. There’s a lot of time and effort involved with that side of the art business that others can handle better through economies of scale. So I like the print-on-demand places that also ship your work, as long as the quality can be trusted. Galleries are wonderful when you can find a good mix of them. I am looking for one or two more. Congratulations on your very inspiring blog. I’ve enjoyed it immensely! 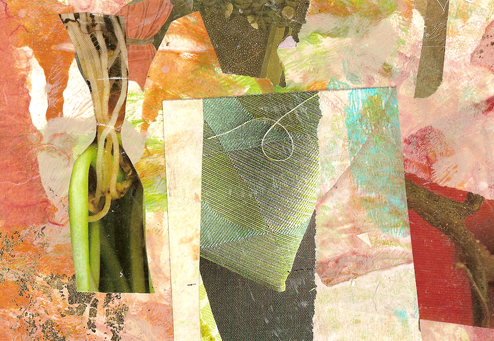 I love your beautifuly happy-looking collage “woven”. Such gentle colours. I wish you well with whatever you decide for selling your lovely work. I second the comment on your productivity and high quality. So nice of you to say, Sandra. That really means a lot to me. what a coincidence…i have been thinking the same thing. i am on a lot of sites, had the scatter gun approach too. i am sure there are still quite a few i am missing when i update too. lol. i’m thinking i will redo and start posting on my blog only. i have a website at http://www.kellyparkerdesigns.com and i understand that it is important to have your own but unless you really promote it i think they get lost in the stacks like etsy items. at least with a blog you can highlight many different aspects of your art, your studio, your paint methods, other artists, etc. so i have decide to concentrate on my blog this year and let my website and other sites go. i do facebook and i seem to get just as much traffic for art there as i do everywhere else, so i will keep that. i had a twitter acct but it got cumbersome…i will revisit that again because i do think it is a good idea. any way, good luck and keep up the wonderful work! !